The world of application development is moving towards the lightning pace and augmented reality is the technology which relates to this statement. 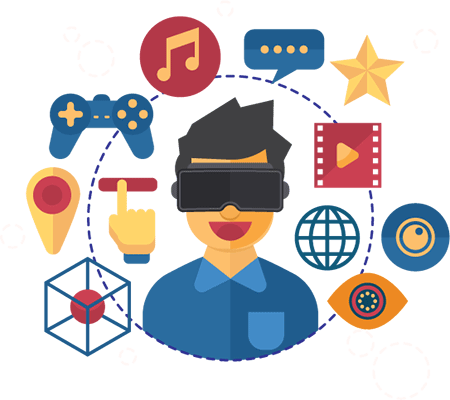 Concetto Labs is an AR application development company who can help you to develop the remunerative Augmented Reality application as per your requirement. Hire Ar App developer and programmer Now. Why Choose Concetto Labs As Your AR Application Development Partner? Augmented Reality is changing the way we view the world. It has created a new realm for the users to experience a virtual world in a more realistic and interactive way. Withholding 5+ years of strong experience in development of latest and trending AR apps and games on major platforms, our team of professional AR app developers has proven record in building highly interactive yet realistic app and games. We know what it takes to develop interactive and scalable AR games and so we utilize the latest techniques to fasten project delivery. We adhere to the industry standards so as to deliver the best-ever solution that fits a client’s business goals and objectives. We just don’t leverage access to the dedicated team rather we work with proven methodologies to shape your requirements. Hire dedicated developers and be assured of the unmatched AR apps at affordable rates. Our team is constantly innovating and exploring AR based apps and games using 3D modeling and visualization, location based tracking, 360 degree panoramic, character identification and lot more. Hire AR kit developers from us and get your custom app developed with the latest technology. Thinking forward to kick-start with new AR based app? Don’t panic! Drop us a word to arrange a conversation over a cup of coffee soon. Contact us now. How we created high-end services and how we deliver it for augmented reality app development? Concetto Labs have significant years of expertise in the delivering following services for Augmented Reality Apps. As it is the mixture of both digital technology and reality, it allows to create a variety of application through single technology. It has taken travel application to the whole new level. Do you want to create your own traveling AR application? It helps to improve the real–time driving by using the latest computer vision algorithms and smartphone. Augmented reality allows you to feel the live scenario through Augmented reality TV apps. You can interact with the environment in an immersive way. AR camera app uses a mobile camera and other mobile sensors to provide us more detailed information about our environment. You can enjoy your videos via performing various video editing functionalities. Even it allows you to save the photographs and videos into your mobile gallery. It can give you the feel of horror with the 3D animation. If you like horror shows, you can enjoy it better over here. If you have your own web application and want to create chat app for the same then it is feasible. We can be the best choice for you to create your own web app with AR functionality. Create something extraordinary from others. Don’t you want to create an amazing effect on your photographs to make it more attractive? Here, you can get the most amazing AR photography applications. How we became AR experts and your choice in augmented reality app development? As one of the top AR development company, we always keep in mind to speed up the project delivery. We cling to the company work ethics to deliver the best ever solution that can meet our client’s requirement. At Concetto Labs, you will directly connect with our professional expertise that will give a curve to your vision. You will be assured for the distinctive AR app solution at very affordable cost. How we enhance the level of our services to gain higher end over our competitors? You will receive highly technology oriented solution at Concetto Labs. We always believe in updation and we follow it. You will get an access to our tools and technology which will connect you with our technical environment. Our technology-oriented developer always come with an elegant and unique solution to work with. We always delivers our work in a way to produce effective results. Your developed AR apps from concetto Labs will increase your productivity with a good amount of ROI.